María Estela Barco Huerta, General Coordinator of Thousand Currents partner DESMI in Chiapas, Mexico. Desarrollo Económico Social de los Mexicanos Indígenas (Social and Economic Development of Indigenous Mexicans, or DESMI) is one of the oldest and most reputable grassroots organizations in Chiapas. That does not mean that DESMI has it all figured out. Listening, deeply, and learning is at the heart of DESMI’s work with indigenous people. 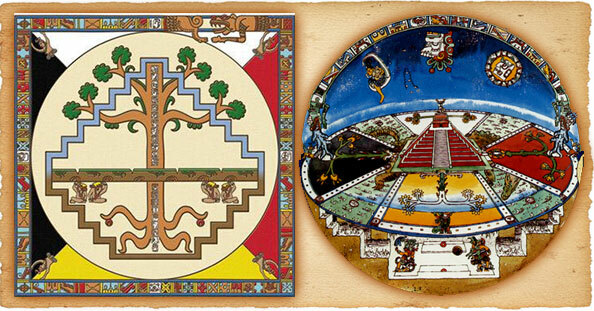 Lately, DESMI has been learning more the Mayan Tzeltal cosmovision with a new board member, a Mayan anthropologist who has been challenging DESMI’s team to reflect on the worldview that is a society’s attempt to explain and better understand all that surrounds it, including its place within the cosmos, or universe. Claiming of communities’ indigenous and inherent wisdom often means un-learning what has been decimated by dominant, imperialist narratives. So last month following the Thousand Currents Academy, our staff jumped at the opportunity for María Estela Barco Huerta to teach us about what’s needed to build individual consciousness, work collectively, and to take a more expansive view of global solidarity. The following words in italics are gathered and paraphrased from María Estela’s translated presentation to the Thousand Currents staff. Thanks to Katherine Zavala for the inspired, and grounded, and heart-full translation. “Stalel (un modo de ser) is present in every community. There are two interpretations – the size of one’s heart or strength of spirit, and the structure of the community and its customs. We are learning that customs can be changed if they are not a positive way of being, for example, why don’t men ever make tortillas? 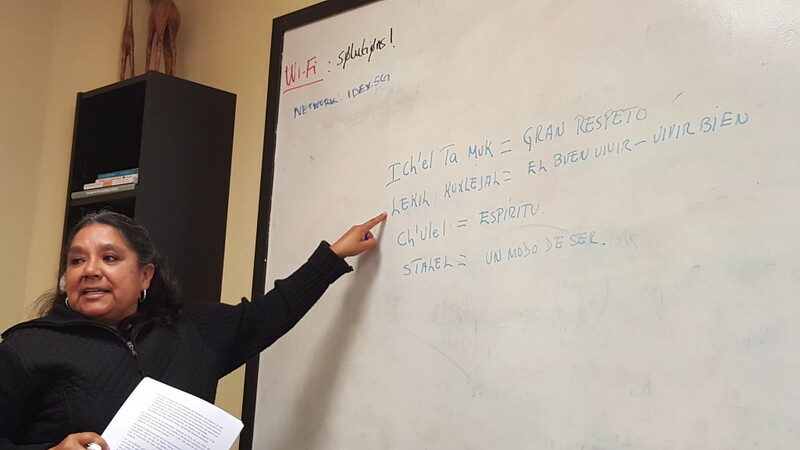 “Ich’el ta muk (gran respeto) means you don’t say “Hello, how are you?” with indifference. You greet people recognizing their dignity, their “bigness.” Everyone feels. They walk. They talk. This concept of the gran respeto encompasses also self-determination for women and what they want to contribute. 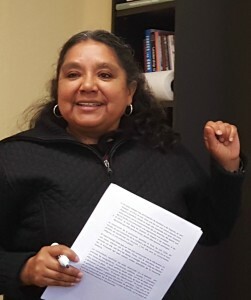 María Estela Barco Huerta leads the Thousand Currents staff in a “Buen Vivir” workshop in their offices. María Estela shared that these indigenous concepts are another way of seeing the world outside of the current system. When everything becomes commoditized under capitalism, the system can become destructive, focused only on reproducing itself. And then when communities are not in harmony, collective work suffers because people’s spirit is being affected by negative energy. María Estela challenged us to think about decolonizing our minds as the homework of everyone, not just indigenous people. María Estela also highlighted DESMI’s work with autonomous municipalities [Good Governance Councils in Chiapas formed by the Zapatistas] shows that these indigenous concepts are part of how they are structured. These councils work collectively from ich’el ta muk in that each person contributes what they know, without large amounts of financial resources, based on their responsibilities to each other. 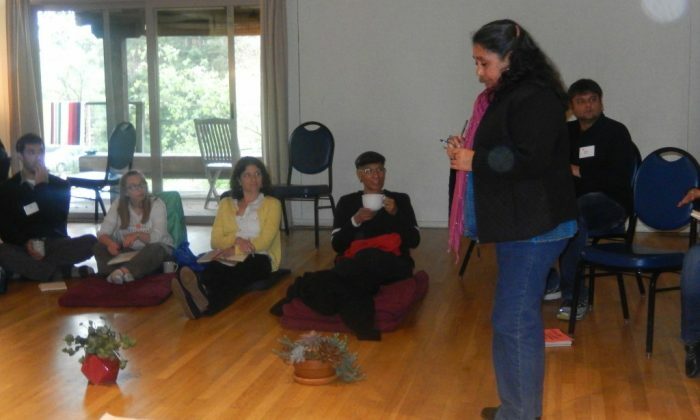 María Estela leading a session at the IDEX Academy. Taking care of our responsibility to people, not in material terms, means that we are growing as people. That is our homework, to grow as people, to share our hearts with each other. María Estela challenged the Thousand Currents staff to see the big “tarea” [homework] ahead of those of us in the United States – to form the political consciousness of people here. There are many ways. Chains of solidarity can reach around the world and generate change within communities, where people can be people, living with dignity.